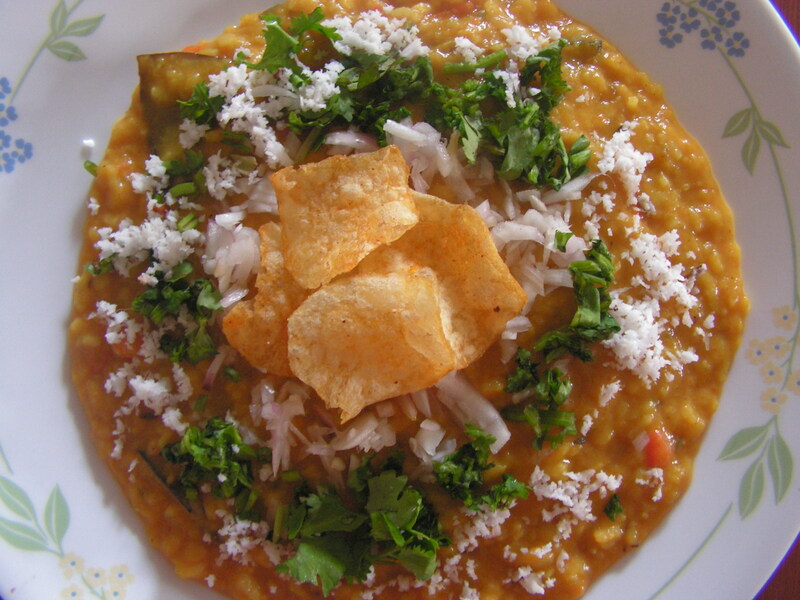 Dal-kichadi – a maharashtrian dish prepared with a combination of Basumati rice and toor dal accompanied with all masala ingredients and relished with a dash of pure ghee garnished with onions, cilantro and potato chips just like the Karnataka special dish Bisibele bhath. 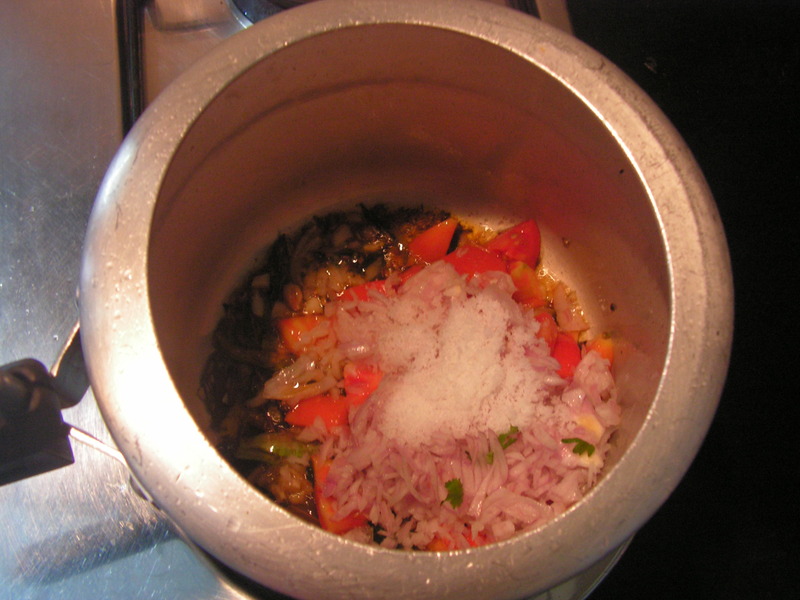 The only difference could be that we add a lot of vegetables and a masala with dry copra and tamarind juice. This dish is surprisingly very light on the stomach and tasty too ! 1. Place a cooker with 2 tablespoons of butter in it on medium flame. On heating add tej patha to it. 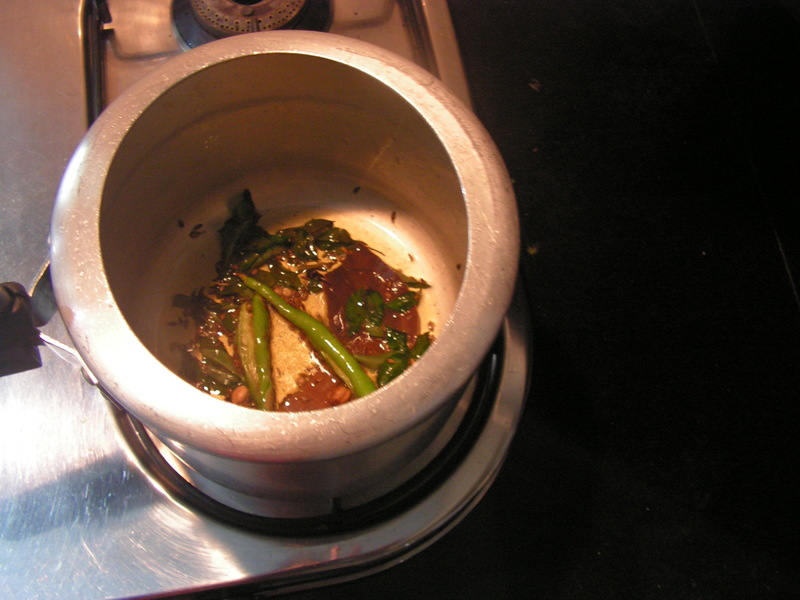 On frying add whole spices like the cardamom, cinnamon, cloves , curry leaves and finally slit green chili to it. 2. When fried add chopped onions and tomatoes and salt and fry till tomatoes turn mushy and onions also fried along with it. 3. When fried add chopped ginger, chopped garlic pods and fry for a while. Now add all powders in a row and just give a stir to it. 4. 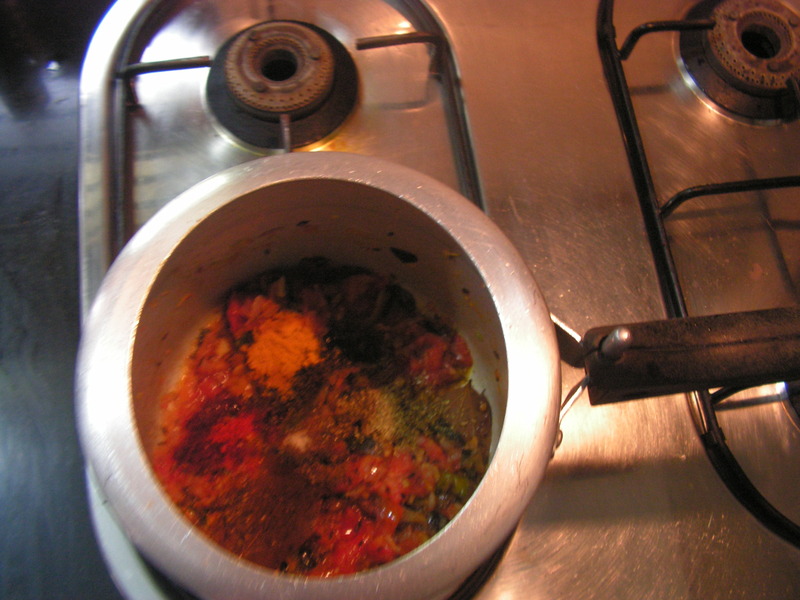 When done add toor dal and rice to it and also give a stir and add 3 and 1/2 cups of water to it checking for salt. Close the lid and cook for 30 minutes as usual on sim flame and switch off heat. 5. Transfer it to serving dish and garnish with chopped cilantro, chopped onion and the yummy potato chipssss !! 1. 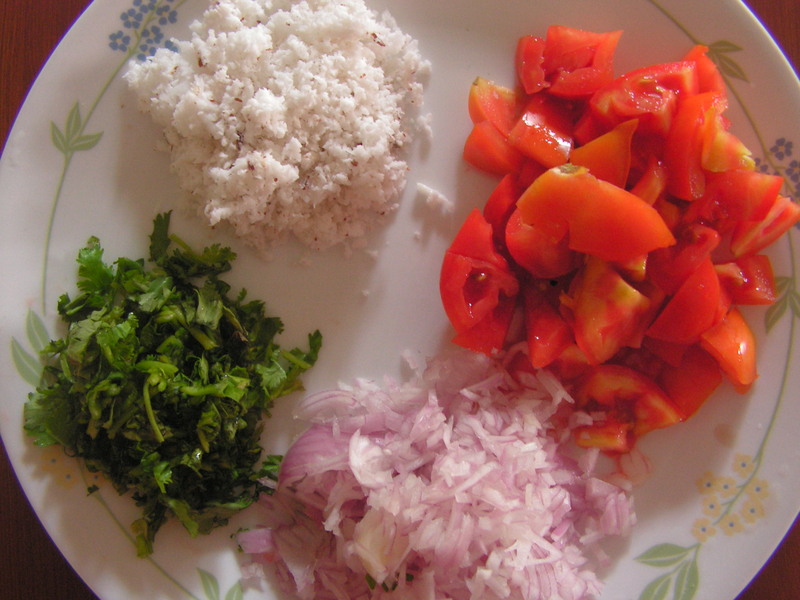 It is better to use basumati rice for this dish rather than the ordinary raw rice. 2. 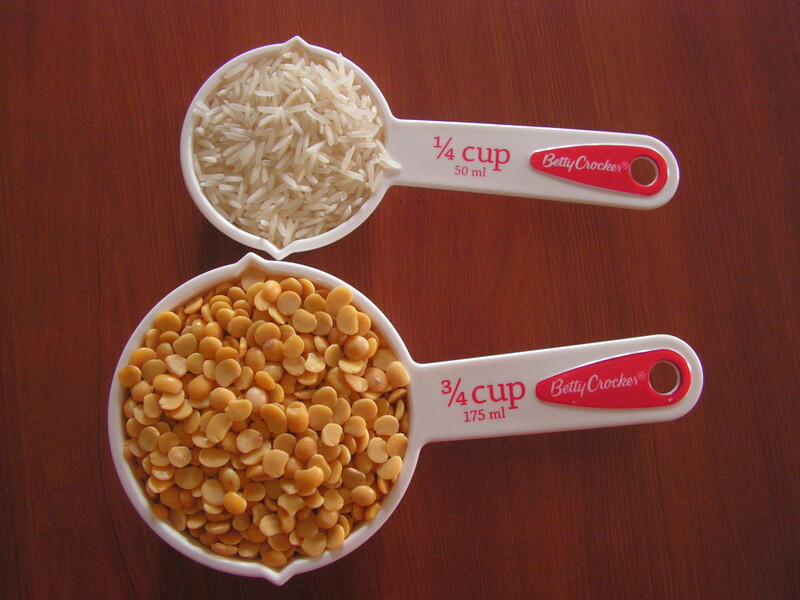 This dish should be semi solid as shown in the image and hence the above mentioned quantity of water should be added. 3. using coconut is purely optional for garnishing. one can omit it for sure. This entry was posted in Uncategorized and tagged Lunch box, Maharashtrian dish. Thanx a lot for your comments and also for dropping by the web site. Thanx a lot and do give a try for the same and send me da feed back please. I have been a silent reader of your blog and really enjoy it very much. I love your step by step pictures and explanations, and the easy to follow neatness of your recipes. It looks delicious and I wish to scoop up some of its yumminess from here right now. Hope to make it in the weekend. I loved this recipe. It reminded me of the dal khichadi I used to eat in Mumbai, during my internship. My husband, who has eaten it only once before in Mumbai, is a huge fan of this dish. I get repeat requests for this, and I never fail to impress! I love your blog and frequently have tried various dishes. 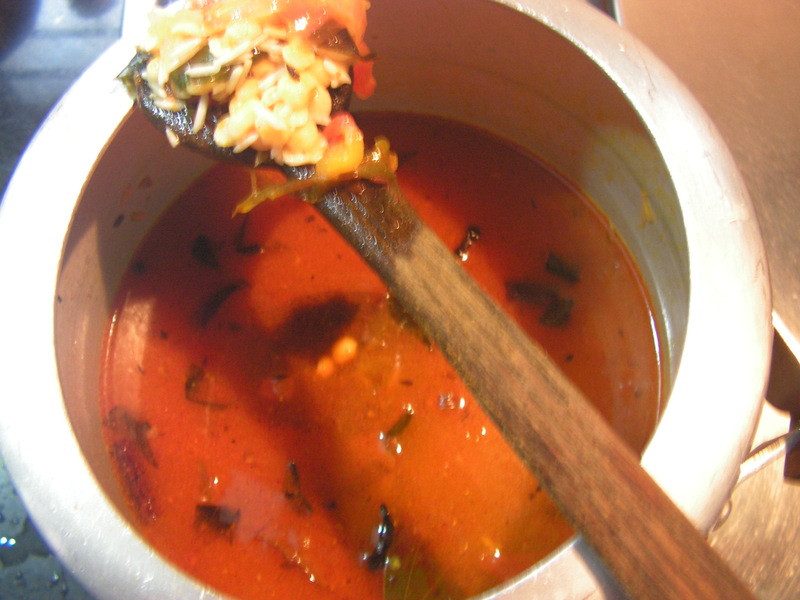 This dish looks similar to Bisi bele bath.. I am curious to try.. Can you tell me what is Goda masala powder?? I have never heard of it before. 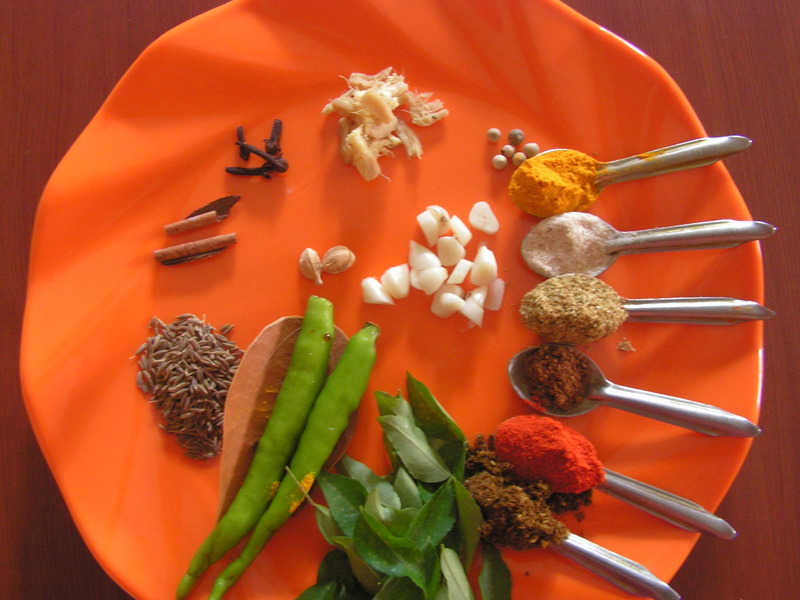 Goda masala is a Maharashtrian masala available in Bombay, pune and other places and widely used in few of their dishes. Now it may be available down south too.